A physical activity questionnaire is a practical and widely used approach for physical activity assessment in epidemiologic investigations. Activity questionnaires have been used in studies relating physical activity to fall and fracture risk, balance and gait characteristics, bone density, and coronary heart disease in older people. PASE was initially developed in early 90s to provide an instrument to investigate specifically older people with an age-specific physical activity questionnaire, filling what was an important need in epidemiological research at that time. 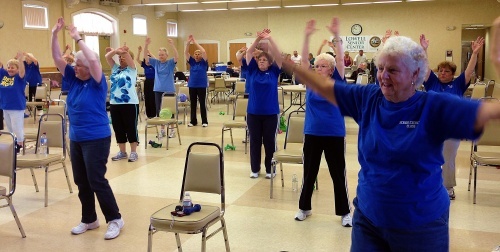 Physical Activity Scale for the Elderly (PASE) is a brief (5 minutes) and easily scored survey designed specifically to assess physical activity in epidemiological studies of persons age 65 years and older. 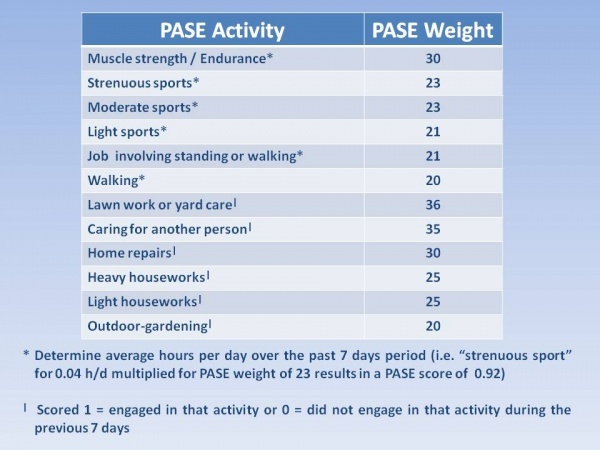 The PASE score combines information on leisure, household and occupational activity. The PASE assesses the types of activities typically chosen by older adults (walking, recreational activities, exercise, housework, yard work, and caring for others. It uses frequency, duration, and intensity level of activity over the previous week to assign a score, ranging from 0 to 793, with higher scores indicating greater physical activity. Occupational, household and leisure activities are investigated by PASE, over a one-week period. The questionnaire can be administered by mail or interview (telephone or in person). The observed effect of mode of administration on physical activity estimates is of concern and authors recommend that the telephone version of PASE be the method of first choice, furthermore they suggest that the mail questionnaire be used in a modified form with additional respondent instructions in order to clarify the proper categorisation of activities, thus reducing reporting error in the mail version. During the past 7 days, how often have you seen the sun? Answer all items as accurately as possible. All information is strictly confidential. 1. Over the past 7 days, how often did you participate in sitting activities such as reading, watching TV, or doing handcrafts? 1.b On average, how many hours did you engage in these sitting activities? 2a. On average, how many hours per day did you spend walking? 3. Over the past 7 days, how often did you engage in light sport or recreational activities such as bowling, golf with a cart, shuffleboard, fishing from a boat or pier or other similar activities? 3.b On average, how many hours did you engage in these light sport or recreational activities? 4. Over the past 7 days, how often did you engage in moderate sport and recreational activities such as doubles tennis, ballroom dancing, hunting, ice skating, golf without a cart, softball or other similar activities? 4.b On average, how many hours did you engage in these moderate sport or recreational activities? 5. Over the past 7 days, how often did you engage in strenuous sport and recreational activities such as jogging, swimming, cycling, singles tennis, aerobic dance, skiing (downhill or cross-country) or other similar activities? 5.b On average, how many hours did you engage in these strenuous sport or recreational activities? 6. Over the past 7 days, how often did you do any exercises specifically to increase muscle strength and endurance, such as lifting weights or pushups, etc.? 6.b On average, how many hours did you engage in these strenuous sport or recreational activities? 7. During the past 7 days, have you done any light housework, such as dusting or washing dishes? 8. During the past 7 days, have you done any heavy housework or chores, such as vacuuming, scrubbing floors, washing windows, or carrying wood? During the past 7 days, did you engage in any of the following activities? Please answer YES or NO for each item. a. Home repairs like painting, wallpapering, electrical work, etc. b. Lawn work or yard care, including snow or leaf removal, wood chopping, etc. 10. During the past 7 days, did you work for pay or as a volunteer? 10b. Which of the following categories best describes the amount of physical activity required on your job and or volunteer work? The PASE authors devised a set of item weights (Table 1) for the PASE questionnaire by using principal components analysis and regression techniques. Total PASE scores are computed by multiplying activity weights by activity frequencies. Table 1: Contribution of each questionnaire item to the overall PASE score is determined by the product of the sample mean and activity weight. PASE shows strong evidences for validity and reliability useful for large epidemiological studies on general population. On more specific conditions this instrument may not be as accurate as required, and further studies on specific conditions are needed. Washburn et al. first studied PASE construct validity in early 90s, and it has been established by correlating PASE scores with health status and physiologic measures. PASE scores were positively associated with grip strength (r = 0.37), static balance (r = +0.33), leg strength (r = 0.25) and negatively correlated with resting heart rate (r = - 0.13), age (r = - 0.34) and perceived health status (r = -0.34); and overall Sickness Impact Profile score (r = -0.42), thus showing a strong validity of this instrument. PASE construct validity has been further studied in 1999. This time it was established by correlating PASE scores with physiologic and performance characteristics: peak oxygen uptake, resting heart rate and blood pressure, percent body fat, and balance. PASE scores were significantly associated (P<0.05) with peak oxygen uptake (r = 0.20), systolic blood pressure (r = -0.18) and balance score (r = 0.20); despite this, no significant associations of PASE score and diastolic blood pressure, resting heart rate, or percent body fat were noted. Anyway, these results provided additional evidence for the validity of the PASE as a measure of physical activity suitable for use in epidemiology studies on the association of physical activity, health, and physical function in older individuals. In 2004, PASE stability and convergent validity has been assessed among rural, community dwelling elderly persons using Computer Science and Applications, Inc. Actigraph Monitors (Actigraph) as the direct criterion measure. The study showed there was a statistically significant Spearman correlation coefficient of 0.43 (p<0.01) between Actigraph data and total PASE scores, thus showing good validity even when compared with digital technologies. in 2008 Hagiwara et al. evaluated a Japanese translated version of the PASE with three hundred and twenty-five (325) healthy and elderly subjects over 65 years enrolled. Concurrent validity was evaluated by Spearman's rank correlation coefficient between PASE scores and an accelerometer (waking steps and energy expenditure), a physical activity questionnaire for adults in general (the Japan Arteriosclerosis Longitudinal Study Physical Activity Questionnaire, JALSPAQ), grip strength, mid-thigh muscle area per body-weight, static balance and body-fat percentage. The PASE score was significantly correlated with walking steps (ρ = 0.17, P = 0.014), energy expenditure (ρ = 0.16, P = 0.024), activity measured with the JALSPAQ (ρ = 0.48, P < 0.001), mid-thigh muscle area per body-weight (ρ = 0.15, P = 0.006) and static balance (ρ = 0.19, P = 0.001). Therefore, the Japanese version of PASE was shown to have acceptable validity. More recently, PASE validity has been studied for specific conditions. In cancer patients, PASE has shown a low construct validity but a good content validity. In hip osteoarthritis patients, the PASE construct validity was poor revealing that it was unable to assess PA intensity levels. Therefore authors stated that PASE is not recommended as a valid tool to examine PA level for patients with hip OA. On Washburn et al. paper from 1993 authors stated that the PASE test-retest reliability coefficient (0.75) exceeded those reported for other physical activity surveys. Back then, test-retest reliability has been assessed over a 3-7 week interval, resulting in a 0.75 (95% CI = 0.69-0.80). Results showed also reliability for mail administration (r = 0.84) was higher than for telephone administration (r = 0.68). Hagiwara et al. in 2008 evaluated reliability of the PASE Japanese version, by the test–retest method over a period of 3–4 weeks. The proportion of consistency in the response between the first and second surveys was adequately high, with a intraclass correlation coefficient for the PASE score of 0.65, showing this instrument to have acceptable reliability too. Reliability has been evaluated also in specific conditions. In cancer patients, reliability for the PASE scores ranged from good to excellent (ICC = 0.67 to 0.90); in hip osteoarthritis patients, the test-retest reliability of the total PASE score was moderate, with acceptable ICC, but with large measurement errors. To order the PASE tool, click here. For detailed information about the PASE Questionnaire with regards to various populations, we direct you to the Shirley Ryan Ability Lab website. For full access to the manual and scoring sheet, click here. The fracture predictive ability of a musculoskeletal composite score in old men - data from the MrOs Sweden study. ↑ Washburn RA, Montoye HJ. The assessment of physical activity by questionnaire. Am J Epidemiol. 1986 Apr;123(4):563–76. ↑ Sorock GS, Bush TL, Golden AL et al. Physical activity and fracture risk in a free-living elderly cohort. J Gerontol 1986; 43: M134-139. ↑ Campbell AJ, Borrie MJ, Spears GF. Risk factors for falls in a community-based prospective study of people 70 years and older. J Gerontol 1989; 44: Ml12-117. ↑ Dalsky GP, Stocke KS, Ehsani AA et al. Weight- bearing exercise training and lumbar bone mineral content in post-menopausal women. AM Intern Med 1988; 108: 824-828. ↑ Marti B, Pekkanen J, Nissinen A et al. Association of physical activity with coronary risk factors and physical ability: twenty year follow-up of a cohort of Finnish men. Age Aging 1989; 18: 103-109. ↑ 6.0 6.1 6.2 6.3 6.4 6.5 6.6 6.7 6.8 Washburn RA, Smith KW, Jette AM, Janney CA. The physical activity scale for the elderly (PASE): Development and evaluation. Journal of Clinical Epidemiology. 1993 Feb 1;46(2):153–62. ↑ 7.0 7.1 7.2 7.3 7.4 Washburn RA, McAuley E, Katula J, Mihalko SL, Boileau RA. The Physical Activity Scale for the Elderly (PASE): Evidence for Validity. Journal of Clinical Epidemiology. 1999 Jul;52(7):643–51. ↑ 10.0 10.1 Dinger MK, Oman RF, Taylor EL, Vesely SK, Able J. Stability and convergent validity of the Physical Activity Scale for the Elderly (PASE). J Sports Med Phys Fitness. 2004 Jun;44(2):186–92. ↑ 11.0 11.1 11.2 11.3 11.4 11.5 Hagiwara A, Ito N, Sawai K, Kazuma K. Validity and reliability of the Physical Activity Scale for the Elderly (PASE) in Japanese elderly people. Geriatrics & Gerontology International. 2008 Sep 1;8(3):143–51. ↑ 12.0 12.1 Liu RDK, Buffart LM, Kersten MJ, Spiering M, Brug J, van Mechelen W, et al. Psychometric properties of two physical activity questionnaires, the AQuAA and the PASE, in cancer patients. BMC Med Res Methodol. 2011;11:30. ↑ 13.0 13.1 Svege I, Kolle E, Risberg MA. Reliability and validity of the Physical Activity Scale for the Elderly (PASE) in patients with hip osteoarthritis. BMC Musculoskelet Disord. 2012;13:26.